Press Officer, flydubai Houda Al Kaissi speaking to the Daily News Business at the Arabian Travel Mart said that they already operate daily flights and are keen to increase frequencies. 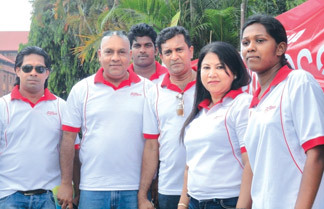 “We have a fleet of 23 aircrafts and would be getting three more end of the year and are very keen to have two flights a day to Sri Lanka,” she said. The official said that the airline is also keen to operate some of these flights to Sri Lanka’s second international airport Mattala from next year. She said that the airline is high on load factors and thisis the reason are keen to add flights. The airline with Jetwing Travels as their general Sales Agent in Sri Lanka has cemented its position as the world's fastest growing start-up airline ever with the start of flights to its 50th destination to Kyrgyz Republic in less than three years expanding its operational route network to 28 countries across the GCC, Middle East, North Africa, Indian sub-continent, Asia and Central and Eastern Europe. Over the past three years it has incorporated avant-garde systems such as Boeing Sky Interior and the ‘Fiber-To-The-Screen In-Flight Entertainment (IFE) system from Lumexis. With the airline’s growing regional footprint, it has also taken significant steps towards reducing its environmental impact by fitting the aircraft with winglets, carbon brakes, Zonal Dryin System, all designed to increase the aircraft’s efficiency and reduce weight, therefore saving on fuel burn. Flydubai’s dynamic growth and pioneering attitude in the aviation industry has not gone unnoticed, with the airline winning a number of plaudits including being named Low Cost Airline of the Year at both the Business Traveller Middle East Awards and Aviation Business Awards 2011. Emirates SkyCargo has been voted Cargo Airline of the Year and, for the 24th consecutive year, was also named Best Middle East Cargo Airline. The carrier “which was also named Best African Cargo Airline - received the accolades at the prestigious Cargo Airline of the Year 2012 awards held at London's Lancaster Hotel. “These awards are voted for by our industry and their recognition of the continued success of Emirates SkyCargo is a great honour,” said Ram Menen, Emirates Divisional Senior Vice President Cargo, who was present at the event. Emirates SkyCargo receives the awards at a time of continuing growth. A fourth Boeing 777F joined its fleet earlier this year, taking its dedicated fleet to eight aircraft, with a further nine Boeing 777Fs on order. Since January, Emirates has introduced services to eight new destinations: Rio de Janeiro, Buenos Aires, Dublin, Dallas, Lusaka, Harare, Liege and Seattle. It will also launch flights to Ho Chi Minh City in June, Lisbon and Barcelona in July, and Washington DC in September. Emirates SkyCargo currently serves a route network of over 120 destinations from its Dubai hub, spanning six continents across the globe. 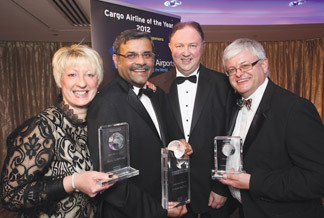 The Cargo Airline of the Year 2012 awards are organized by trade magazine Air Cargo news and attract votes from freight forwarders around the world. The awards are the only event where the British International Freight Association audits and approves the votes cast. In the 2010-11 financial year, Emirates SkyCargo carried 1.8 million tonnes of cargo across its network, contributing 17.4 per cent - US$ 2.4 billion - of the airline's total transport revenue. Based out of Dubai International Airport, its $327million 43,600 square metre Cargo Mega Terminal is designed to handle 1.2 million tonnes of cargo a year. Emirates' 171-strong fleet â€“ including eight freighters (four Boeing 777Fs, two 747-400Fs and two 747-400ERFs) - is one of the youngest in the skies. Emirates SkyCargo serves a global route network that spans 123 points in 73 countries, including 12 cargo-only destinations, while more than 50 of the locations Emirates SkyCargo serves are e-freight compliant. The International Air Transport Association (IATA) announced global traffic results for March showing that total passenger demand rose 7.6% and freight demand climbed 0.3% compared to the same month last year. Comparisons with March last year are affected by events that depressed passenger demand in 2011, including the Arab Spring, which disrupted travel in the Middle East and North Africa beginning in February 2011 and the earthquake and tsunami in Japan in March 2011 that impacted air travel across the Asia-Pacific region. IATA estimates that the year-on-year rise in air travel in March was about two percentage points higher than it would otherwise have been in the absence of these events. Cargo demand, meanwhile, was affected by the timing of the Chinese New Year, which occurred in January this year leading to stronger February shipments but took place in February 2011 leading to stronger March 2011 shipments and weaker year-to-year comparisons. Compared to February 2012, March air cargo demand was significantly stronger by 2.2%. “If we discount the industry’s growth by two percentage points as a result of the extraordinary events in 2011, airlines still managed an expansion in the range of 5-6%. Given the prevailing economic conditions with some European states returning to recession, passenger demand is holding up well. But this is bringing little relief to the bottom line because yields are not keeping pace with the continued very high price of oil,” said Tony Tyler, IATA’s Director General and CEO. Oil prices have remained stubbornly above $100/barrel (Brent crude) for the past 14 months. In 2008, oil prices rose from $90/barrel in January to a peak of $147/barrel in late July. But by November, they had fallen back to less than $50/barrel. “We have not seen such sustained high oil prices previously. Jet fuel prices have risen 8% since January. Considering that fuel now accounts for 34% of average operating costs, it’s an increase that hurts,” said Tyler. Total passenger capacity rose 4.4% compared to March 2011, resulting in a load factor of 78.3%, up 2.4 percentage points over the year-ago period. Freight capacity, however, climbed 1.7% year-on-year, above the rate of demand, placing pressure on load factors. Air India Express, the low-cost airline subsidiary of Air India launched its seasonal fares this April. To introduce this promotional offer, the staff of Air India Express Sri Lanka recently held a road show in the town of Kandy. The program was attended by the Country Manager for Air India Madhuri Samudre. Air India Express which commenced services in 2005 currently flies to over 30 destinations including thrice weekly services from Colombo to Chennai. Although a low cost carrier, the airline provides a complimentary light meal to its passengers as well as limited onboard entertainment facilities. Keeping in line with its mission to provide convenient connectivity at the most affordable prices to passengers the airline currently offers the lowest return air fares to Chennai at Rs.13,800. Millennium Transportation Pvt Ltd, a member of the Hayleys Group is the sole General Sales Agent for Air India Express in Sri Lanka.